Aboriginal people across Canada are urging stores to stop selling what they call racist Halloween costumes, and they're posting photos of the costumes to social media to turn up the pressure. From coast to coast, stores are stocking costumes with names like "Reservation Royalty" and "Chief Long Arrow," and some customers are telling them that they've had enough. 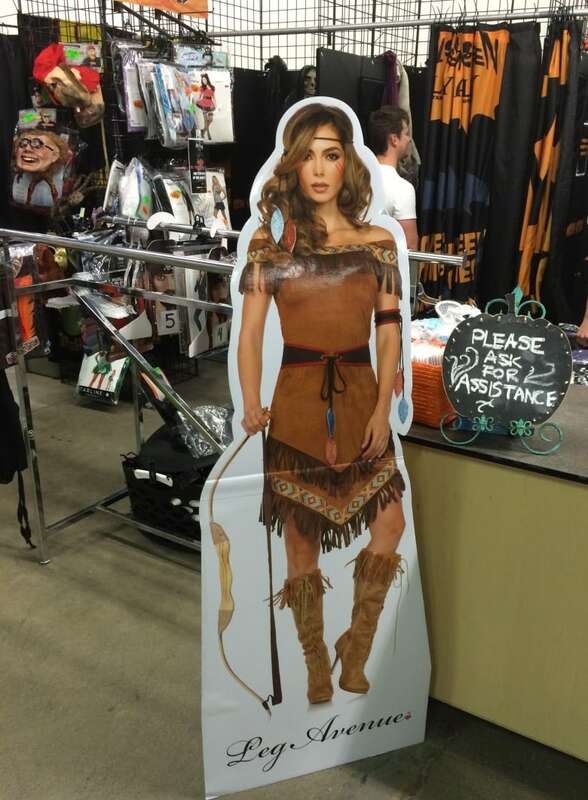 A store in Truro, N.S., agreed to remove such costumes from its stock after a Mi'kmaq woman complained. Stacey Marshall Tabor took her daughter to the store right after she had been dancing in her regalia to celebrate Mi'kmaq history month — regalia that looked similar to the costumes in the store. "Here I am trying to show my daughter be proud of who you are, be proud of your culture, be proud of your traditions," she said. "Then, we walk in there to buy her a Halloween outfit that's supposed to be fun, and they're mocking her." 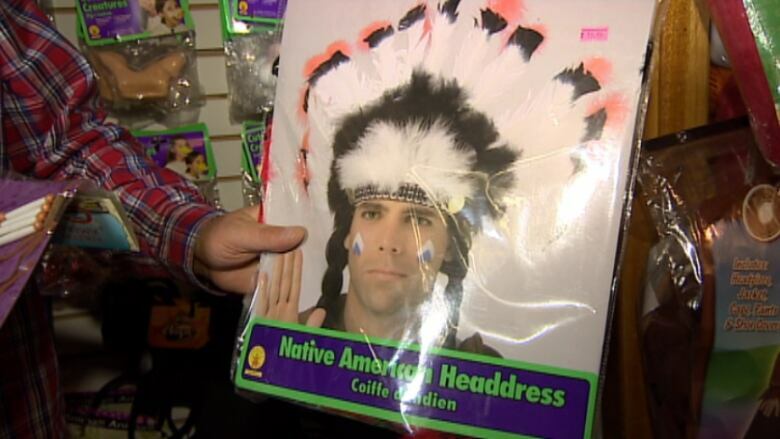 In downtown Toronto, indigenous protesters are picketing a Halloween chain store for selling such costumes. A Winnipeg children's store was selling aboriginal-themed costumes with the label "rubbies," an offensive term for someone who drinks rubbing alcohol. After photos of the labels were posted on Facebook, the store apologized and pulled all the costumes, saying the label was a printing error. 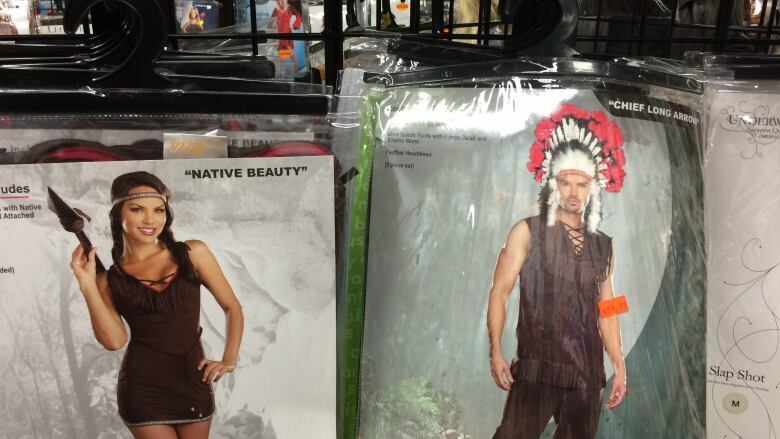 One store in Regina refused to remove their "Noble Warrior" and "Huron Honey" costumes after complaints. "I feel like these costumes promote an incredibly negative stereotype that is outdated and considered inappropriate," Cindy Freeman said in a Facebook post. A Calgary store defended selling Indian headdresses, saying they were trying to meet a demand. Jeffrey McNeil-Seymour, a member of the Tk'emlúps Tes Secwépemc Indian band, went Halloween shopping recently with his sister and nieces at a mall in Kamloops, B.C., and saw costumes with names such as "Chief Many Feathers." He complained to the store and posted photos of the costumes on Facebook. He said his initial reaction to the costumes was that it made for "an awkward conversation to have with your children and nieces and nephews." "I think we need to be thinking critically about selling these culturally appropriative and racist costumes," he said. McNeil-Seymour said the symbolism of buying and putting on the costume of an indigenous person for a night can be troubling, especially in light of how First Nations people are viewed in Canada and some of the issues they are facing, such as the troubling cases of murdered and missing women. "If we look at these costumes as a metaphor, so to speak … here are people going out and purchasing these cheap plastic costumes, and they're for a one-time use, and they're easily disposed of afterwards," he said. McNeil-Seymour, a sessional instructor at Thompson Rivers University, said it's surprising to see how little some of his students know about the colonial history of Canada, including topics such as residential schools. "The fact that this is the first time in their educational history that they're being taught these topics — at the university level — is really problematic," he said. He says a lack of education across Canada about these issues could be the reason he sees so many people in comments on news websites and on his own Facebook page defending the right to wear Indian costumes and telling those who complain to "get over it." McNeil-Seymour says most people understand that blackface has a racist history in American theatre and that painting yourself up as a black person isn't acceptable. But many people still don't appreciate how offensive dressing in an Indian costume can be, he said. "It's really funny when non-native persons will be all over, for instance, the blackface issue, but then, in another instance will be defending their right to be culturally appropriative and racist by wearing an indigenous-inspired costume," he said. McNeil-Seymour says he has confronted people wearing headdresses at Halloween parties in the past. "It is a really difficult discussion to have because obviously the person wearing the costume still is really invested in not hearing what you have to say," he said. "It's hard to approach that subject in a good and meaningful way because, typically, tensions usually flare in that moment." He said posting photos of the costumes in the store and discussing the issue on social media can be more productive. "I think that social media is a wonderful tool to be able to collectively address these issues. I think there is a lot of power in going public with these things." "It really comes down to the person or persons of said culture," he said. "If they say no, then no."